These necklaces are crocheted using colorful strips of fabric. The crocheting is completed entirely in the humble chain stitch; the necklaces are also embellished with wire-wrapped glass pendants. If you're interested in getting started with fabric crochet, these necklaces are an easy -- and quick -- introduction to the technique. Before you jump into crocheting, say, an entire rag rug or even a smaller project like a rag bag, why not give one of these necklaces a try? It'll give you a chance to practice crocheting with strips of fabric, and to make sure you enjoy the process before you commit yourself to a really time-consuming project. The two necklaces pictured above were my first two attempts at making rag crochet jewelry. I'm so happy with how they turned out; they're colorful, vibrant and much more wearable than I anticipated when I started out. These necklace designs were inspired by the pendants themselves. I owned the pendants for several years before I figured out what I should do with them; up until now, they were never quite right for any of the other projects I attempted to use them in. The loops on these pendants are large, and they didn't look that great when worn on a simple chain or cord. They needed something more substantial than either of those options. It finally occurred to me that they'd make the perfect embellishment for necklaces crocheted out of strips of fabric. The fabric strips are hefty enough to fill up the large loops, and the pendants add a nice amount of weight and visual interest to the crochet work. This necklace was my first attempt at rag crochet jewelry. This version has three wire-wrapped pendants; a large teardrop-shaped pendant is the focal point in the center, and it's surrounded by two smaller pendants, one on either side. While I'm pleased with the way this necklace turned out, I do think the version with five pendants is even nicer. I suppose that's a matter of personal preference; this version is a bit lighter, and also a bit less expensive. So, I figured I'd give you the option of making both, or either, version if you like; I've posted the patterns for both versions of the necklace. Fabric, Matching Thread, and Sewing Machine or Needle: I used strips of a colorful batik fabric to crochet my necklace band. This fabric has spots and dots of red, pink, orange, yellow, green, blue, and purple. My fabric strips were purchased in the type of bundle that quilters refer to as a "jelly roll." The brand is "Stripz." My fabric strips were already pre-cut into pieces measuring about 2.5 inches high by about 46 inches long. I cut them in half again the long way so that my pieces measured about 1.25 inches high; then I sewed bunches of strips together to make a rag ball. For this particular project, you don't need an entire rag ball; a piece measuring about 122 inches long will suffice. Traditionally, rag crochet strips are cut on the bias, meaning in diagonals. Cutting them on the bias helps to cut down on the problem of frayed edges. The stripz fabric strips are not cut on the bias, and the edges do fray significantly. To fix that problem, I folded the edges in towards the center, then folded the whole thing in half again, then stitched the folds together using my sewing machine. A sewing machine isn't a necessity; I've made similar rag balls on the road by hand stitching them. It takes much longer, but it's doable. In either case, my resulting fabric strips measure about 1/4 inches after stitching. You don't need to buy Stripz to do this project, although it's a nice shortcut if you do. If you don't, you'll need to cut your own fabric strip measuring about 1.25 inches by 122 inches. Crochet Hook: I used a size K hook to crochet these necklaces, but you can use the hook of your choice. The most important thing is that your hook is a comfortable size for you to work with your fabric strips. The K, for me, was actually a little on the small side, but I didn't have a bigger hook handy when I was working on this project. Pendants or Embellishments: You'll need 3 wire-wrapped glass pendants or the pendants/embellishments of your choice. Gauge: 4 inches = approximately 9 ch sts. Finished Size: This pattern is designed to be one-size-fits-most. I made my sample necklace about 46 inches long including the ties; the ties are extra-long and a bit could be cut off the ends, depending on the wearer's neck measurement. The crocheted area measures about 15.5 inches. Thread your three pendants onto the fabric strip and push them about 16 inches or so down the strip. Decide how long you want your ties to be. I made mine about 12 inches, which is a bit excessive; yours can be shorter if you like. Leaving the length for your ties unworked, make a slip knot in the spot you want to begin crocheting. Ch 15. Slide the nearest pendant right up close to the work, ch 3, slide the next pendant close to the work, ch 3, slide the next pendant close to the work, ch 15. End off by pulling the rest of the fabric strip through the active loop. Because you'll be using the ends as ties for closing your necklace, you don't need to weave them in. Neat, huh? This necklace was my second attempt at rag crochet jewelry. This design has five wire-wrapped glass pendants; a large teardrop-shaped pendant is the focal point in the center, and it's surrounded by four smaller pendants -- two pendants on either side of it. Fabric, Matching Thread, and Sewing Machine or Needle: To crochet the necklace band, I used strips of a colorful batik fabric in cool colors -- greens, blues, and purples with tiny accents of yellow and orange. My fabric strips were purchased in the type of bundle that quilters call a "jelly roll." The brand is "Stripz." My fabric strips were already pre-cut into pieces measuring about 2.5 inches high by about 46 inches long. I cut them in half again the long way so that my pieces measured about 1.25 inches high; then I sewed bunches of strips together to make a rag ball. For this project, you don't need to make a whole rag ball; a fabric strip measuring about 122 inches long will suffice. Rag crochet strips are typically cut on the bias. This helps to cut down on the problem of frayed edges. The stripz fabric strips are not cut on the bias, and the edges do fray quite a bit. I did not want frayed edges to show in the finished project, so I folded the edges in towards the center, then folded the whole thing in half again, then stitched the folds together using my sewing machine. A sewing machine isn't a necessity; I've made similar rag balls on the road by hand stitching them. It takes much longer, but it's doable. In either case, my resulting fabric strips measure about 1/4 inches after stitching. 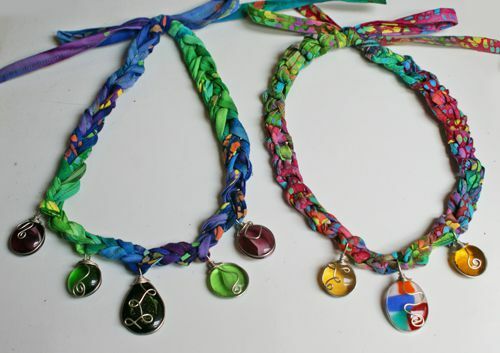 Pendants or Embellishments: You'll need 5 wire-wrapped glass pendants or the pendants/embellishments of your choice. Thread your five pendants onto the fabric strip and push them about 16 inches or so down the strip. Ch 12. Slide the nearest pendant right up close to the work, [ch 3, slide the next pendant close to the work.] Repeat sequence in brackets until the other pendants have been worked; after the last pendant, ch 12. End off by pulling the rest of the fabric strip through the active loop. Because you'll be using the ends as ties for closing your necklace, you don't need to weave them in. Want to see pictures of this? My tutorial shows you more details. Here's how my rag ball looks after I've processed all my strips using the sewing machine. When I started the project, I didn't know how much fabric I'd need, so I made a lot; you don't need to do this much. A length of about 122 inches should hopefully suffice. In the picture above, you can also see how my pendants look when they have been strung onto the rag ball. Upper Photo: You'll want to push the pendants a good way down the fabric strip before you start crocheting. This will give you some room to work. In this picture, you can see my slip knot; I'm all ready to start working my chain stitches. Lower Photo: Here I've crocheted my first grouping of chain stitches. In the necklace pattern, I give you the instructions to slide a pendant close to the work, and then you crochet more chain stitches afterwards. Here's a close-up picture of how it looks after I've slid one of my pendants over and then started to crochet the next chain stitch. See how the pendant gets caught inside the stitch? That's exactly what you want it to do. Upper Photos: These pictures show me finishing up the chain stitch. Upper Photo: Here's a close-up picture of the pendants after the necklace has been crocheted. I bought my pendants on ebay from the glass artist who made them, but I am planning on making my own pendants for future projects. I rounded up a list of free instructions and tutorials for making these; if you'd like to try this, the following links will help you make it happen. Celebrate your friendship with this thread crochet bracelet pattern!